Cape Town attractions have made it a famed destination for many Hollywood & Bollywood stars and diverse global travelers alike. Take a trip to on the Cape Winelands and taste South Africa's homegrown wines; see the world from your vantage point on the top of famed Table Mountain; dine like a king at any of South Africa's fantastic restaurants and celebrate the great outdoors even during the winter months. 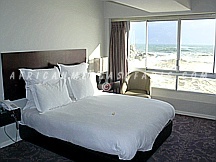 Below is a listing of Bantry Bay Cape Town accommodations in South Africa. 52 De Wet was renamed from Cascades On 52 - it offer a luxurious and very contemporary lodge with panoramic views over the Atlantic Ocean. The lodge is an architectural masterpiece, a show-case for ultramodern design in which nature and urban living blend seamlessly. Rooms are designed with off-white paint on the walls, cherry wood for the doors, floating shelves and cupboards in combination with black floor covering. Ambassador Hotel offer a benchmark in service standards and comfort. From virtually every room you look on to the sea, sunlight skips on the waves by day while silver lights up the night. Granite rocks glint, washed clean by the unceasing surf and all the time the invigorating ozone renews and refreshes the spirit. 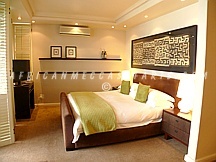 With a choice of 68 elegantly appointed air-conditioned en-suite hotel rooms. Ellerman House s a luxury boutique hotel offering five-star luxury accommodation that is a home away from home for the traveler that seeks luxury accommodation and privacy. It has two splendid suites and nine luxury en suite rooms of which seven have spacious balconies with magnificent views over the Atlantic Ocean. Ellerman House is world-renowned for its exceptional hospitality and fine art collection. Les Cascades de Bantry Bay is perched on the slopes of Lions Head, dramatically overlooking the Atlantic Ocean. This Indonesian inspired retreat is located in Bantry Bay, one of the most exclusive suburbs of Cape Town, which is uniquely positioned and completely sheltered from the infamous South Easterly winds. The lodge is a close to all Cape Town attractions. 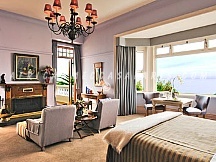 Protea Hotel President is a luxurious seaside hotel in Cape Town. For business or leisure, there's no better choice of venue. Most of the exclusively spacious rooms and suites overlook the Atlantic Ocean or Lion's Head, offering facilities one would expect of deluxe hotel, ideal for a coastal beach holiday in Cape Town. 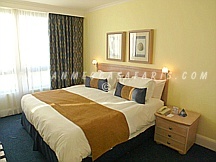 Accommodation at the hotel comprises 349 well-appointed rooms and suites on the Bantry Bay beachfront.